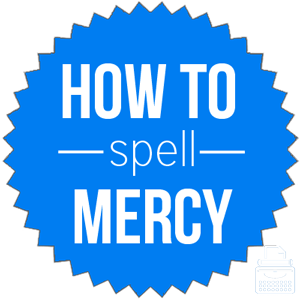 Spelling of Mercy: Mercy is spelled m-e-r-c-y. Definition of Mercy: Mercy is forgiveness or compassion given to someone who is an offender or under the authority of another. In religion, mercy is compassion or a blessing from a divine being. What does mercy mean? Mercy is a noun referring to compassionate or lenient treatment of someone who is to be punished for an offense or who is subject to another’s power. Imprisonment rather than the death penalty for a murderer would be an example of mercy. At his trial, the murderer begged the jury and the judge for mercy. He is the type of leader that shows no mercy to those who have wronged him. Mercy also has a religious meaning; it is considered a divine favor or compassion shown by a deity, such as God. It is due to the divine mercy of the gods that he survived. Mercy can also refer to an act of relief or compassion for someone or something in distress. Though some do not agree with the decision, taking in the refugees was truly an act of mercy on his part. They claimed their mission was one of mercy to help the poor and sick. At the mercy of: under the power or control of; having no ability to save oneself against. According to Merriam-Webster’s, mercy was first used in the 13th century. Mercy comes from Middle English from the Anglo-French word merci, pity or thanks, which originates from Medieval Latin merced-, merces, reward. There are several synonyms for the word mercy. However, the correct word depends on the meaning and context. Mercy is a noun referring to leniency in punishment for an offense or while subject to another’s power. It also refers to a divine favor or compassion shown by God or some other divine being.